After winning four international film festivals, Vegas Vikings is premiering on Youtube on August 26th in conjunction with its theatrical release so that the other struggling high-crime, low-income communities in America can copy the successful blueprint. 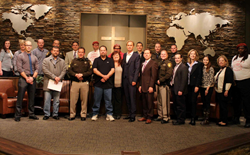 Heroes United - The group behind the successful turn around of Sierra Oeste, the most dangerous community in Las Vegas. Christian Schoyen, an advocate for helping underprivileged children, decided to create a replicable universal 21-day challenge that could be implemented in any struggling high crime community to turn it around. He next traveled to Las Vegas to put his program and social experiment to test in Sierra Oeste, the most dangerous neighborhood of Las Vegas where violent crime was reduced with 75% proving that the impossible is possible. The entire project was documented and resulted in the award-winning documentary. Vegas Vikings reveals a new proven way to change the future for the children living in the struggling low-income communities of America. Vegas Vikings is winner of the Special July Award at the Nevada Film Festival, Golden Kahuna Award at Honolulu Film Awards, Golden Palm Award at Mexico International Film Festival and winner of best feature documentary at Miami Independant Film Festival.